Today the heat index went up to 115 degrees. It was so unbearably hot that all I wanted to do was stay indoors. However, I did make the mistake of taking my dogs out for a brief walk around our subdivision. They came in and plopped down on top of the air conditioning vent while I searched for something ice cold and refreshing to drink. After having a huge glass of ice water I noticed I had quite a few lemons in my refrigerator so I made a batch of lemonade. Even after the water it’s just what I needed to quench my thirst. If you’ve never made homemade lemonade you don’t know what you’re missing. Here are just a few simple ingredients that take no time at all. The key to making perfect lemonade is to make a simple syrup which is just water with sugar dissolved in it. First, start by adding one cup of water to a saucepan and adding one cup of sugar and bring to a boil. This assures you that the sugar won’t just stick to the bottom when making the lemonade. While the simple syrup is cooling juice the 8 lemons. Now to a pitcher add the simple syrup, and the freshly squeezed lemon juice. Next, add two to two-and-a-half cups of water depending on the tartness you like. Then add some lemon slices and ice cubes and pour yourself a glass. Lemonade is the perfect refreshing summertime drink. For a variation: Make Strawberry Lemonade by taking 1 pint of strawberries and pureeing in a blender, add to the lemonade mixture, then adding the 2 1/2 cups water. In place of the water you could also add sparkling water or club soda for some carbonation. Decorate with a strawberry on top and a sliced lemon or place in glass. My daughter went to college in St. Louis – and she doesn’t miss the crazy temperature extremes there! 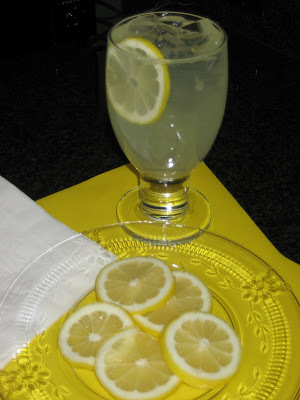 The lemonade looks wonderful, will have to try soon. I ususally use 10X superfine sugar – but the simple syrup will probably work better. Have I mentioned how much I like your new logo and beautiful assortment of produce at the top of your blog? Wish I could get veggies and fruit that looked that good at my supermarket. When you make the simple syrup Maria, the sugar has the chance to dissolve making it a smoother beverage. Either way would work, but the simple syrup would be my preference.